Kyani started as a small company in 2005. Our focus then, as it still is today, was bringing the attention of the wild Alaskan blueberry, called the Kyani berry, to consumers. The native Alaskan berry has the same delicious taste as its more well-known cousin, the highbush blueberry. Alaska berries have all the health benefits attributed to common blueberries, which also makes them a “superfood.” The popularity of the blueberry for good health, along with Kyani’s ambition to bring good health and wellness to people around the world, has led to our success as a globally renowned organization. Today, we operate in over 65 countries around the world. Our outlook appears h2er than ever, with a unique combination of consumer demand for health products and our sustainable business model. Curious about joining the team? Here’s what you should know. Everyone has heard of blueberries, but did you know that there many subspecies within the blueberry family? One of those species is the Alaskan wild blueberry, or the Kyani berry. The Kyani berry is smaller than cultivated blueberries you find in the store. However, many people find Kyani berries to be more flavorful, which makes them an excellent choice for a marketable product. These berries are chock full of antioxidants, which have been shown to have numerous health benefits for both humans and animals. In fact, studies have correlated berry consumption with improvement in coordination, balance, and memory. Many consumers like the sounds of eating blueberries for good health, but berries are not always easy to come by. Therefore, a brand like Kyani, which combines all the benefits of a berry into convenient and readily available products, makes a difference. The good thing about producing a product that everyone wants is that you don’t have to drum up support. Instead, you might have a harder time meeting demand! Fortunately, that’s precisely what makes Kyani successful and leads to great business opportunities. Working for Kyani translates to success for both product producers and distribution companies. And as a distributor, you get to try out Kyani’s products yourself. Talk to friends afterwards or use social media to tell everyone how delicious Kyani’s products are, and you are literally in business! Distributors will be delighted to know they are acquiring a successful and highly marketable product, too. But of course, one concern that many people have about joining or partnering with a new company is its stability. Fortunately, Kyani has passed the “danger” zone that faces many emerging businesses and sometimes causes their demise. Many new companies start off on a good foot, but they end up losing steam and eventually failing due to fluctuations in consumer health trends. Kyani has been around for more than 10 years, which means our products have gained trust and a good reputation among consumers. And instead of just surviving, Kyani is now thriving! Sustaining a global network of distributors is certainly a challenging task. Job opportunities arise constantly to keep current consumers satisfied and find new channels for product distribution. Working with Kyani means that you can work with a very flexible schedule based on your availability. Starting is simple – you’ll first get basic educational training about our products and how the company operates. Then, you’ll receive some user-friendly sales and marketing tools to help sell Kyani’s premier nutritional products. Learning on the job is one of the fastest and most effective ways to learn about a new product. With our simple tools, you can learn quickly as you go along. As you build confidence, you’ll find that it doesn’t take long at all to get others interested in Kyani, too. This is a winning situation for everyone involved, as you’ll be able to make more sales, and sell faster, which translates to more income and more rewards for you. Consumers, meanwhile, benefit from improved health and the assurance that they are making quality choices in terms of their nutrition and well-being. After all, who knew that all-natural products like Nitro, Sunrise, Sunset, and our best-selling Health Triangle tasted so good? Whether they are short-sighted, unsustainable, or unclear, some companies have business models that ultimately fail. Fortunately, that’s not the case with Kyani. Our business model is built on four sturdy pillars that helped get our business off the ground and now keep it afloat. The first facet of our business model is science. Without evidence supporting the benefits of products they sell, companies are at risk of going under. This is especially true with the rise of social media, which allows consumers to share their experience – both good and bad – with a product or a company. Before we even put a label on a product, we study scientific data to make sure we’re delivering a quality product to end consumers. In addition to providing quality products, we use a global network of professionals in all parts of the supply chain to grow our business. From seminars and webinars to hands-on training and meetings, you’ll get the valuable information you need to contribute to the ongoing success of our company. The third pillar of our success is cutting-edge, direct sales technology. This technology enables us to increase sales, make customers happy, and keep distributors well-stocked. Furthermore, using this technology lets you make more connections, so you can theoretically sign up new customers and distributors every day. Finally, we offer a competitive compensation plan that you won’t find from many employers. We have a tiered system of success, where efforts that every employee makes to improve is noticed and applauded. Bonuses, vacations, a new car, and of course promotions are some highlights of our reward system. 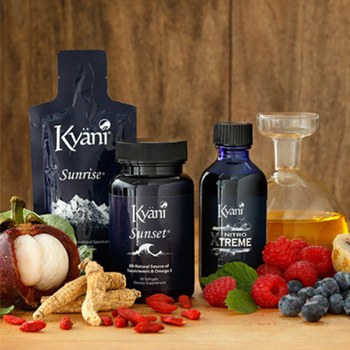 Many people have found success with Kyani, and you can too! Whether you’re starting off as a part-time employee, looking to make a little extra money, or searching for a rewarding career change, we welcome your initiative and enthusiasm. If you have an entrepreneurial spirit and you are motivated to help others live healthier lives, you may be a good candidate for a career with Kyani. Similarly, if you’re a distributor looking for an exciting new product to sell, this is your chance. With the flexibility our company provides and opportunities for advancement, there’s no reason not to consider a business opportunity with us! When you’re ready to start an exciting new career, contact us for more information on how to start.